Bogs and fens, conifer swamps, shrubby peatlands, stream borders; generally a calciphile. 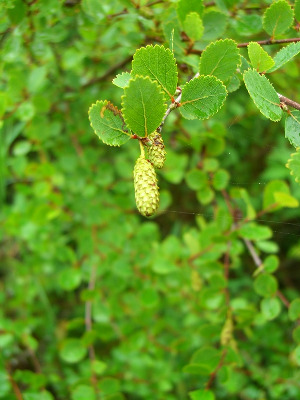 Bog birch is a bushy shrub up to about 3 m tall, but usually no more than half that large, the twigs and young leaves extremely variable: glabrous or pubescent (puberulent and/or with longer hairs), with warty glands absent, sparse, or prominent. The blades are often quite glaucous beneath and are rather thick in texture. Hybrids, clearly intermediate, with two of the native tree species may be expected where the parents grow in proximity. Those with B. papyrifera are B. ×sandbergii Britton. They have leaves which are mostly acute, rather than obtuse, at the apex, with 5–6 (–7) pairs of prominent lateral veins, in contrast with the (2–) 3–5 pairs in B. pumila. Mature staminate aments may be as long as 5–6 cm, while in B. pumila they are only (0.8–) 1–2 cm and in B. papyrifera usually 6–11 cm. The wings of the fruit in our hybrid material are a little narrower than the body, but resemble those of B. papyrifera much more than of B. pumila. Plants tend to be intermediate in size between the tree and shrub species and to have many stems with dark bark, scarcely if at all peeling. The hybrid produces pollen and seed copiously and thrives where well established. There is some question as to whether backcrossing and introgression are occurring, or whether plants that resemble B. papyrifera more closely are merely F1 progeny, the resemblance due to the presence of more chromosomes from the polyploid tree parent than from the tetraploid B. pumila (2n = 56). When the parents are as variable as these are, the hybrids must also be quite variable. Betula ×sandbergii has been collected throughout the state. Hybrids with B. alleghaniensis are B. ×purpusii C. K. Schneid. and, as in B. ×sandbergii, are intermediate between the parents in stature and in shape and texture of leaves, which have (6–) 7–9 (–10) pairs of prominent lateral veins and usually an acute apex. The mature pistillate aments are much larger than those of B. pumila, 10–12 mm or even as much as 18 mm thick. The wings on the fruit are much narrower than the body, as in both parents (but not in B. papyrifera or B. ×sandbergii). The bark of fresh twigs has the wintergreen flavor of yellow birch, but this may not persist on dry specimens. A few specimens have leaves more coarsely few toothed and obovate than usual and may be backcrosses to B. pumila. 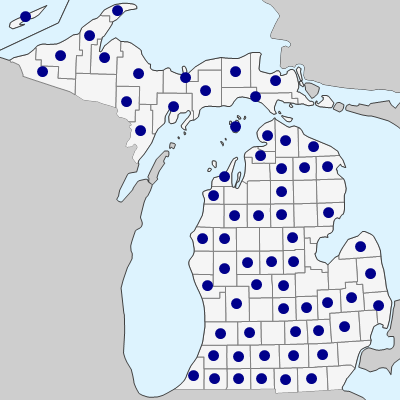 Betula ×purpusii has only been collected across the southern Lower Peninsula north to Clinton Co., despite the fact that both parents occur throughout the state. MICHIGAN FLORA ONLINE. A. A. Reznicek, E. G. Voss, & B. S. Walters. February 2011. University of Michigan. Web. April 18, 2019. https://michiganflora.net/species.aspx?id=554.